Buddy loves his plastic fantastic toys, however I feel they limit the scope for interactive play and I wanted to introduce new things into the mix. So for anyone who is at a bit of a loss for some fun ideas and games to play with their baby, I have complied a list of some of our favourite and simple games. Please note, these are activities that I am happy to do with my child. If you feel an activity is unsuitable for your child please do not attempt it. This is such a simple game but Buddy loves it. It is really your basic peek-a-boo, but every time you jump out (from behind a door or the sofa) you put a different hat or scarf on. This produces squeals of laughter every time and is great to develop his visual awareness. Who doesn’t love bubbles? Buddy loves nothing more than popping them and squeals in delight when we blow them at him. We went one step further and purchased a bubble machine. We love getting messy in this house! This edible baby safe paint is really easy to make and has never stained anything in our home. You can find the recipe here. At the moment I like to paint outside with Buddy as he is very inquisitive at the moment and likes to crawl all over. Painting outdoors definitely cuts down the clean up time. 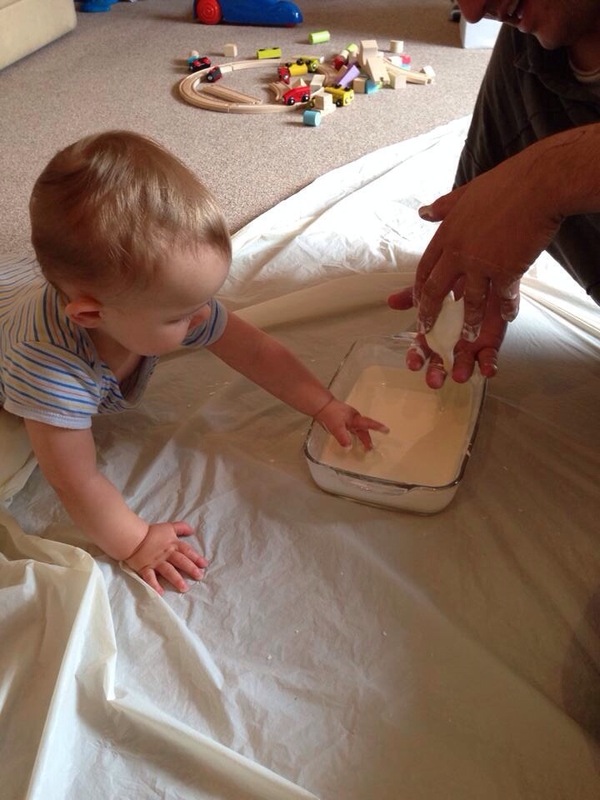 We use the back of wallpaper for painting as it is thicker and less likely to tear when Buddy crawls all over it. You can usually pick up wallpaper for a very good price in bargain bins. Discovery baskets are containers filled with normal household objects for baby to explore. I set up a discovery basket every evening before going to bed and it is the first thing Buddy crawls to in the morning. He will play quietly, investigating the contents and examining items for up to 30 minutes at a time and it is something he enjoys going back to throughout the day. You can find a list of items to include in your discovery basket on the following link. 150 Items to Include in Your Discovery Basket. Today our basket included a colander, a rolling pin, some measuring cups, jar lids and clothes pegs. 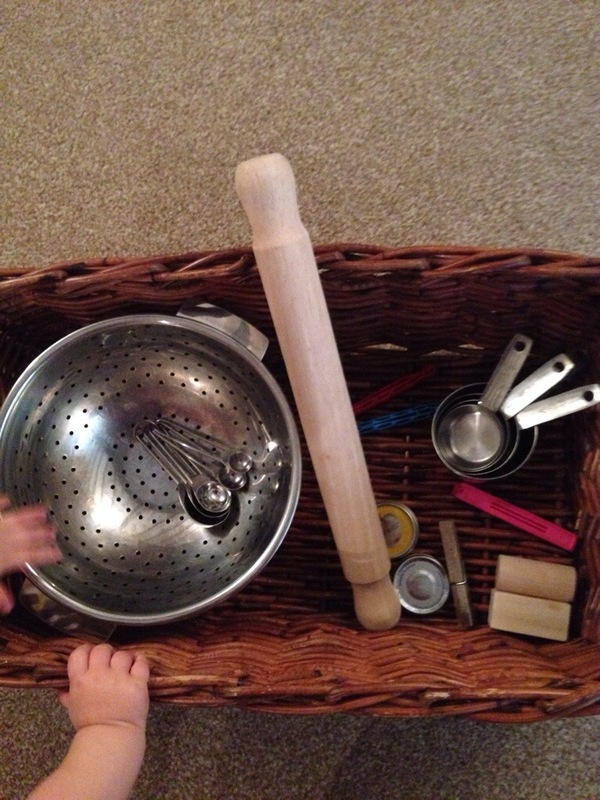 You can read more about the theory behind discovery baskets here and sensory learning here. Make some coloured foam in minutes and let your baby play with it. You can read how by following the link below. I enjoy hiding toys in the foam and watching Buddy look for them. He loves splashing and slopping the foam and also trying to eat it. Note – not suitable for eating and avoid contact with eyes. If you have a child who will happily sit and read a book, I envy you! Buddy will not sit still for long with a book however he does enjoy turning the pages and lifting the flaps on a peek-a-boo book. We make a game of turning the pages by hiding a wooden block beneath the page to encourage him to find it and thus progress with the story. I make sure we have books in all of the rooms that Buddy plays in. They are at a low level to enable him to seek and explore them independently. Buddy really enjoys chasing bottles filled with rice and pasta. These are so simple to make and provide endless entertainment. We practice pushing them to each other. 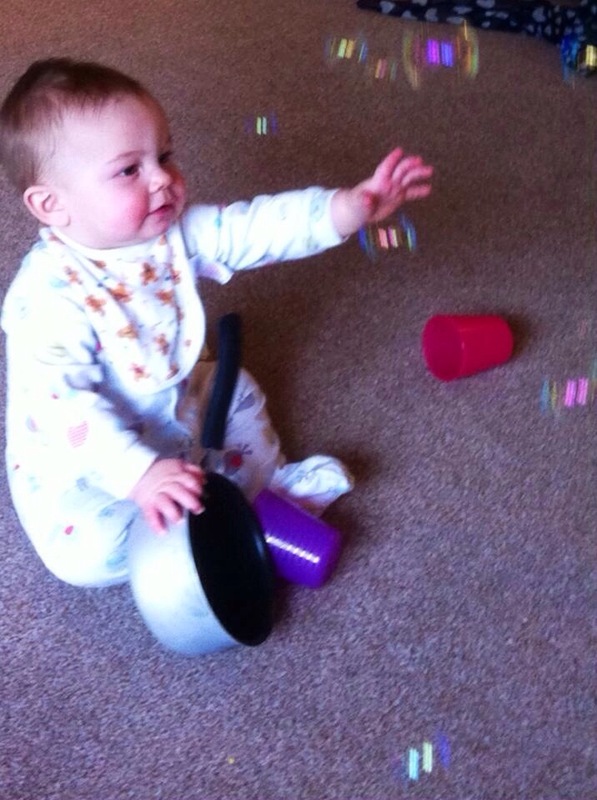 Shaking them and tipping them over to make fantastic noises. Of course, if you are crafty, you can make these look fantastic. I haven’t got round to making mine beautiful yet, but Buddy enjoys them anyway! 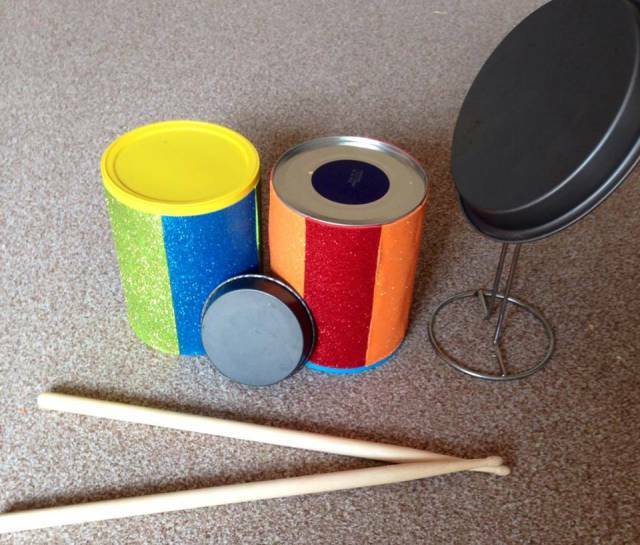 You could also make your own drum kit! 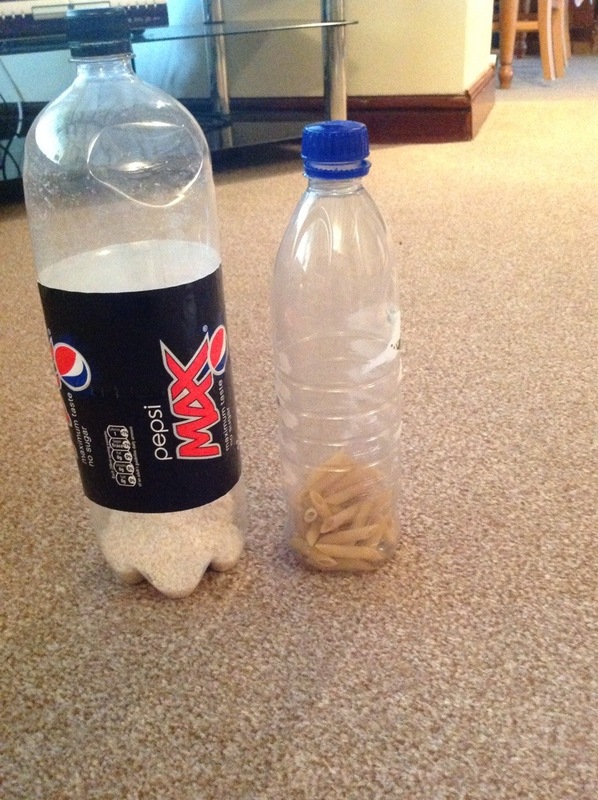 Check out how we made ours here – Home made Drum Kit. This baby safe edible goo is simply cornflour and water. It in interactive and wonderfully messy. You can learn how to make it by clicking the link below. We had fun touching and eating the goo, although I think my husband was more impressed than Buddy was! We know that food is great and essential, so let’s play with it. It doesn’t matter how much your baby actually eats at this age as it can be supplemented with breast milk or formula. The sensory element of it is the important part. Or you could Discover Flour with this super simple sensory bin. Blocks are great for open ended play. We love stacking and sorting them. You can see the result of Buddy’s bulldozer mode here. Buddy also enjoys sorting his blocks. 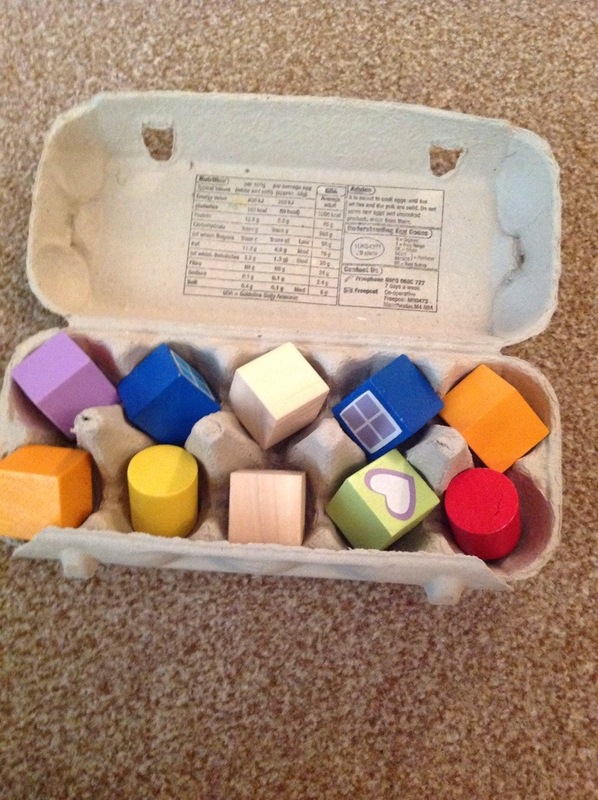 I hide them in old egg cartons and let Buddy search and rummage, tipping them out and putting them back in again. It is a great problem solving activity. 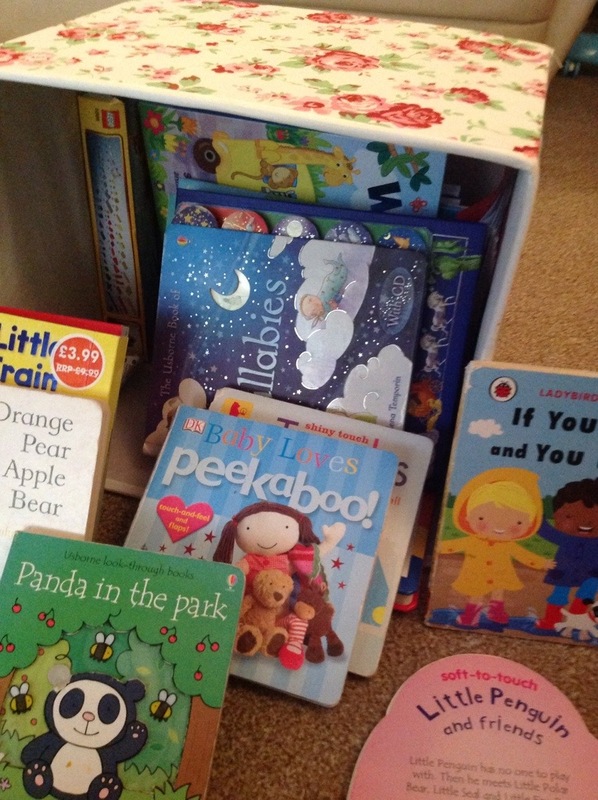 I hope these ideas help you if you are stuck in a bit of a play rut with your little one. I have loads more ideas that I can’t wait to share so please let me know what you think, what you would like to see more of and what you would like to see less of and I will do my best to oblige! Oh these are so simple and completely doable, thank you for sharing! I didn’t realize I was in a rut until I read this article. My babe is not yet mobile so I love the basket ideas especially! Thanks again! I’m glad you found it useful. The discovery baskets were a new find for me too but Buddy enjoys them so much I felt compelled to write about it. I hope you continue to find my posts useful and if there are any activities you would specifically like to see more of please let me know. Thanks Tanya, that’s great to hear! We’re reusing these ideas too with our almost 9 month old baby number three. She loves them! awesome ideas! Thank you! 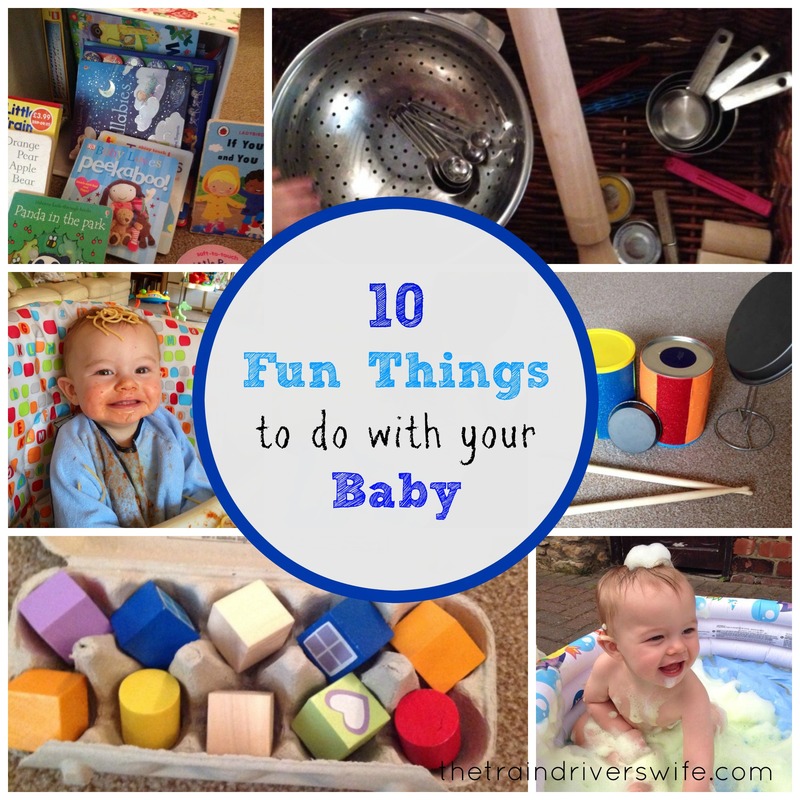 I have a 10 month old who wants nothing to do with his toys and is totally interested in household objects, so these are really fun ideas! I’m really pleased you have found it useful. Discovery baskets are definitely my favourite activity at the moment. 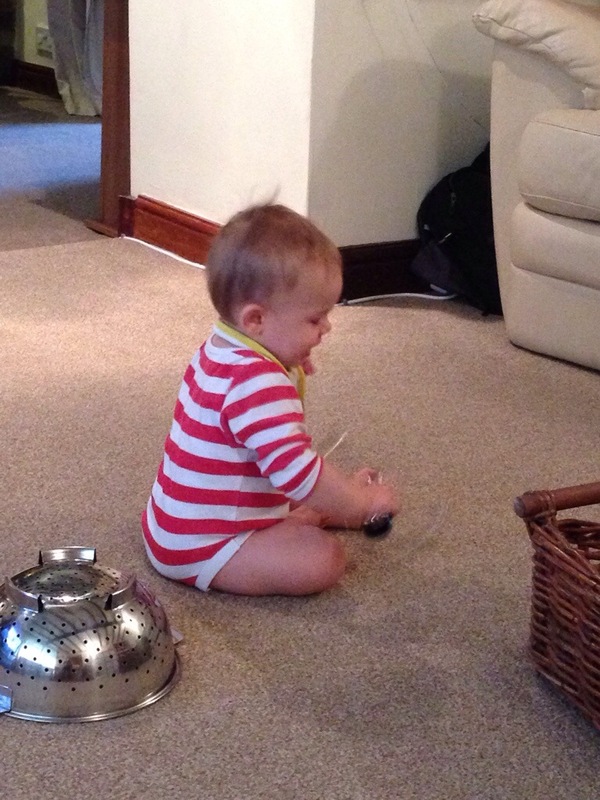 Buddy would much rather play with a whisk and pan than any other toy at the moment. I’m so glad I found this post – I’ve been looking for inspiration and there’s some great ideas here! Going to try edible paint (in the garden!) for sure, looks like lots of fun! It really is good fun! I hope you enjoy the paint! Some fantastic ideas, I’ve never tried the edible paint, off to look up recipes ! I’m pleased you like it! It is great fun 🙂 the recipe I use is here – https://thetraindriverswife.com/2014/06/13/homemade-fun-in-the-sun/ but there are loads of great recipes online! I’m so pleased you like them. The edible goo is one of my favourites! You can also freeze it and make an edible frozen chalk which then melts into a goo! I’ll be sure to check your page out as soon as Buddy goes to bed! I’m glad to hear it! It means I can put my feet up for a couple of years lol! Thank you for all these activities! They’re great ideas (that goo was genius!) and I can’t wait to try them with my little lady when she gets older. I hope she enjoys them! Thanks for visiting and commenting. Thank you. We love simple play over here! I just think it enables him to lead the play better and build on his imagination and thinking. We have lots more messy play lined up which I am super excited about. Great ideas! My kids LOVE anything with bubbles! Glad I found you through the mommy monday blog hop! Aw I’m so pleased you enjoyed it and I hope she enjoys hiding the blocks! These are absolutely brilliant ideas! Thank you for sharing via Mommy Monday Blog Hop. Love these ideas. I have done many of them with my 9 month old. I love the idea of dress up peek-a-boo! We will try that this afternoon. Thanks! Dress up peek-a-boo is great fun! I hope your little one enjoyed it. Fyi.. Not sure if it’s on your end or mine. When I click the link for 150 Discovery Basket items, my browser blocks it and says it’s a malicious link. Hi Sondra. I’m so pleased you enjoyed these ideas and thank you for letting me know about that broken link! I’m not sure why it isnt working but I’m working on it! I love these ideas and Buddy is so adorable! 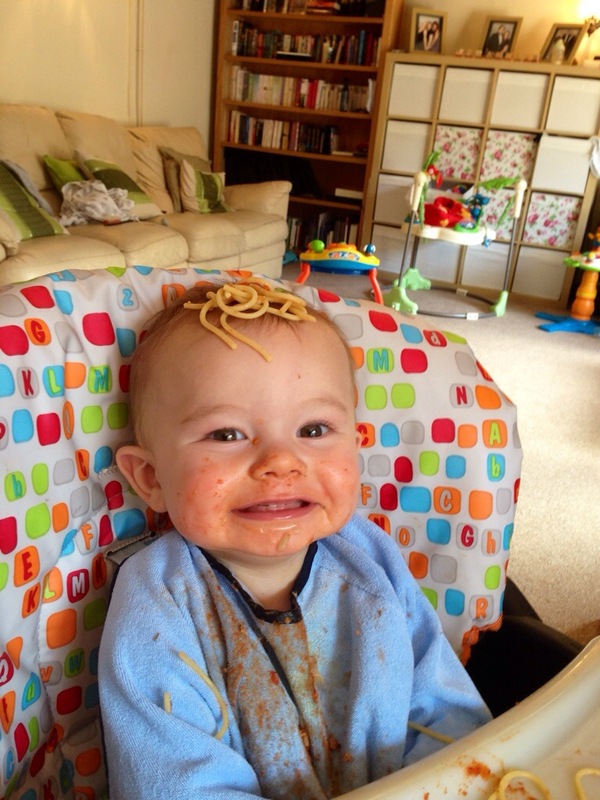 The spaghetti pic just makes me smile! These are such great ideas! 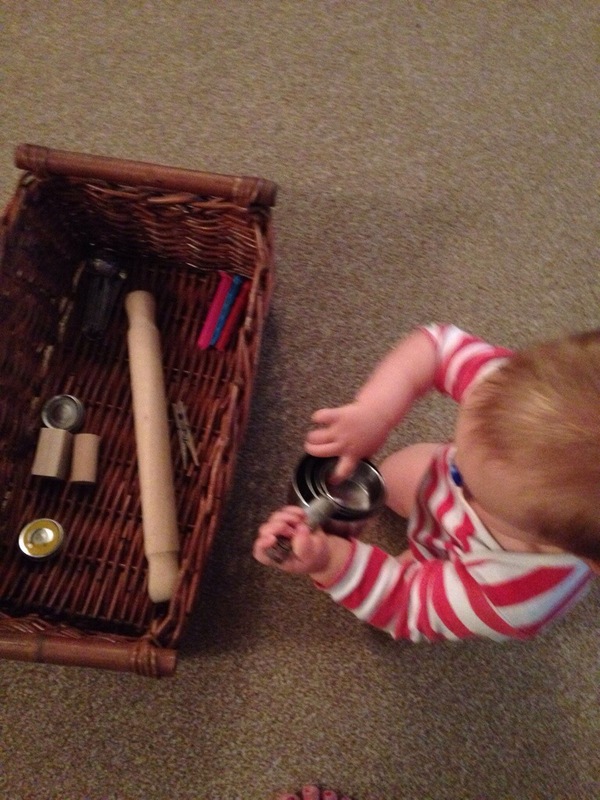 I especially love the DIY instruments and the discovery basket… definitely saving that list of items to use for our own. I can’t wait to use these activities with my daughter! Thank you for this! I am an elementary teacher and am home for the first time since maternity leave with my little one this summer. Although I have no problems coming up with activities for my students to do in class, I was surprised that I had no idea what to do with my baby all day. I am going to try some of these today! Oh I’m so glad you found these ideas useful Sheila! I hope you and your baby have some amazing fun today! My baby is almost 10 months and very active. I was looking for some fun ways to keep him busy. These are so easy to set up. Thanks a ton. I’m so pleased you found them useful! I’d just like to say thank you for posting these. They are really useful and fun. Please do let me know if you have any other posts I can read. 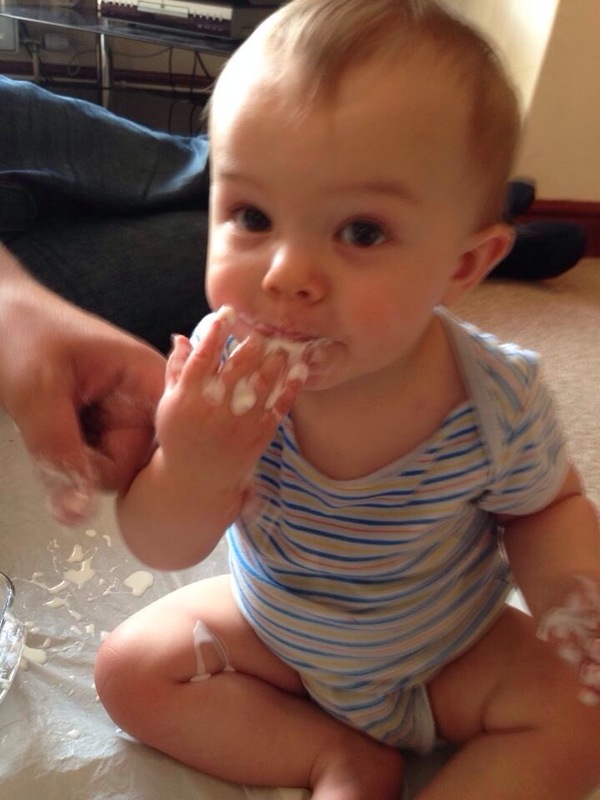 My son is nearly 10 months old and we are home together everyday, whilst I take him out I would love interactive activities we can do at home. Hi Rosh, I’m so pleased you like it. Our second is now ten months old too and we’ve started to pull some of these activities out again for her. It’s great how engaged they are at that age and how fascinating they find everyday things! You may enjoy this post I guest posted on the Realistic Mama page. We found both kids have been able to munch quite happily with few teeth. Their gums are so hard they are able to mash up lots of different foods without help. We started slowly and built our confidence. Baby led weaning is so much fun! Good luck! That’s awesome- makes sense! Thank you!! I don’t think you are all that bright. 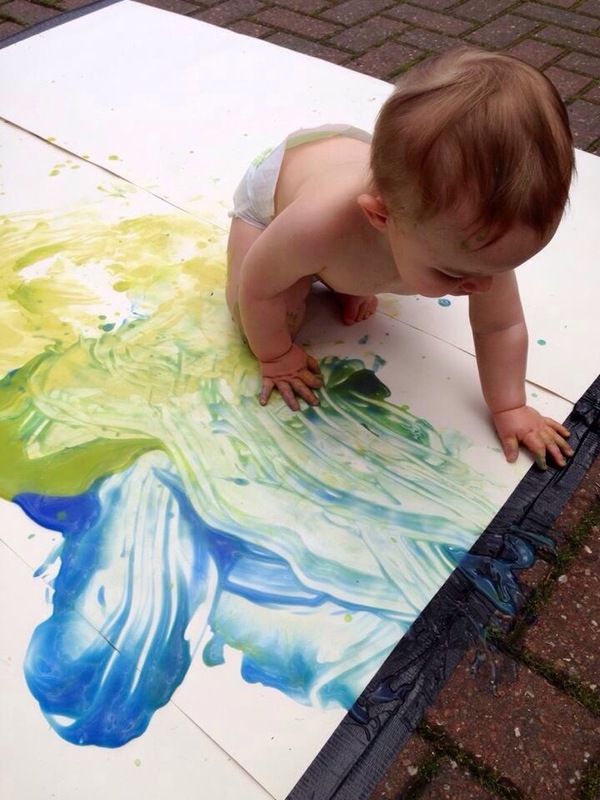 You are teaching your baby to eat paint. Unless your baby is a genius and can read he doesn’t know if it is edible. Further more you must not be to ken on table manners. Also it is important how much food they eat or do you care about how much nutrition he gets. Thank God my grandbaby has parents who are smarter than you!!! I’m sorry my post 10 fun things to do with your 8-10 month old baby caused you to not only question my intelligence but also the well being of my son. I’d like to take this opportunity to reassure that “Buddy” is now three and a half years old. He is healthy, intelligent and exceeding most of his milestones. He is also an excellent eater who has very good table manners for a three year old. As to how bright I am? I must say having two young children takes its toll. I have been known to put the car keys in the fridge from time to time whilst distracted, however we function pretty well. I found these articles which I thought you may find interesting. My whole ethos with young children is to allow them to explore their environment in a safe and age appropriate way. Young children in particular explore the world with their mouths so what could be better than enabling them to do so safely in a fun and colourful way that enables us to explore new ideas, textures and language? Of course, now Buddy is three we don’t do taste safe sensory play so much unless his younger sister is joining in. We are able to explore more textures and themes as he is able to understand that not everything is for eating. I have found that this type of play has expanded his vocabulary and has encouraged him to feel more adventurous and confident in approaching both new foods and new experiences. It saddens me that you felt you needed to be so insulting in your opinion of my parenting. Perhaps I should be less sensitive? Perhaps I would feel differently had I not been up all night with a sick child. Regardless, please remember that bloggers who share activities that we enjoy with our children do so because we love our kids and love having fun with them. We’re all just parents, trying to do our best, and tearing each other down does nothing but spread ugliness in this world. This post is awesome, and guess what – kids are going to taste paint until they are 18months, so either you don’t paint with them – or you provide a safe alternative. She’s not doling it out in a bowl, she’s just ensuring that it’s not toxic. Too bad your grandbaby doesn’t have a kind grandma! How deeply cruel you must be to feel so moved to comment nasty things to someone who is putting a resource out there to help others. Shame on you. Wooooooah.. what are you like, 12? Why you hating? The whole point of this post was about having fun. You sound like a pretty boring and mean grandma. Get a life. Pingback: 10 Fun Things to do with your 8-10 Month Old Baby – Think Again. Thank you! These are exactly the kind of things I was looking for for my 8 month old. So simply yet I know he will love them. Can’t wait to try them all out! THANK YOU for sharing! I am so excited to try these ideas. What a very helpful, practical, well put together post that brings joy and good memories to so many parents! These are such great and affordable ideas! My daughter is 8 months old and is not mobile yet so she gets bored very quickly with things. I can’t wait for us to try some of these out! Thanks for the ideas, I can’t wait to try them out. I am really looking forward to the Discovery basket and in the future, edible goop! Before there were any fact names like sensory play, this is what we mom’s did. Open the cupboard door and let the baby climb I. And pull out pots and pans and beat on them with wooden spoons to hear the different sounds, I’ve them a box full of Tupperware and let them stack, babies are little scientists, they don’t need fancy toys. just let them explore their safe environments. I can’t believe someone would be so mean. The idea is to bring pleasure and safety. You gave good ideas alternatives and instructions. I wonder if this didn’t work for the grandma. I really like how you responded. It all was wonderful. Thank you for your kind comments. I’d like to report back that we now have three children, none of whom have developed a taste for paint! Thank you. What great ideas, I can’t wait to try them with my ever active 8 month old! I love the basket idea in particular.